Tuskegee Air Women, 1940s. Assigned as weather observers and forecasters, cryptographers, radio operators, repairmen, sheet metal workers, parachute riggers, link trainer instructors, bombsite maintenance specialists, aerial photograph analysts and control tower operators in the Air Corps. Black American women were denied the right to fly during World War Two because of their race. Mildred Carter’s rejection letter from the Women’s Airforce Service Pilots was cold, plainly stated and infuriating. Mrs. Carter, then Mildred L. Hemmons, was among the first women to earn a pilot’s license from Tuskegee Institute’s civilian air training school. The school became legendary with the success of the Tuskegee Airmen in World War II. When the 477th Composite Group, also known as the Tuskegee Airmen, came to Lockbourne Army Air Base in the spring of 1946, they brought with them women in uniform. 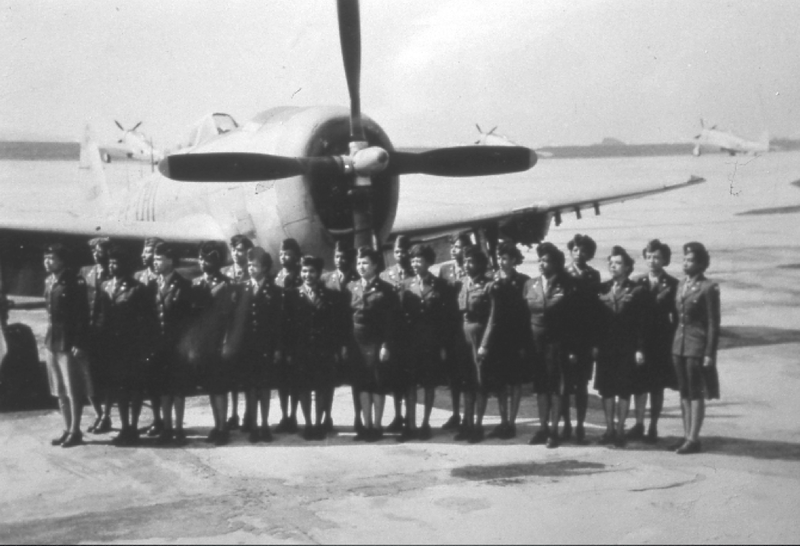 Most of the women were assigned as weather observers and forecasters, cryptographers, radio operators, repairmen, sheet metal workers, parachute riggers, link trainer instructors, bombsight maintenance specialists, aerial photograph analysts and control tower operators. A few lucky Lockbourne WACs were assigned flying duties. One of the outstanding features of Lockbourne was their band, 766th Air Corp Band and their touring show called Operation Happiness. Operation Happiness was a fun-packed and enjoyable show of dancing, comedy, magic acts, jazz, swing and symphonic music. The show featured WAC Evelyn Matthews, who sang “I’ll Close My Eyes”, accompanied by an airmen chorus. She was followed by another chorus called the Skylanders and a dance group called the Lockettes. The show featured WAC Sgt. Verline Jones, who sang “Stormy Weather”, WAC Rebbeca Gilbert, who performed a top hat, white tie dance. The Ohio State News, a Black community publication, said in its December 25, 1948 edition, “More than 2500 citizens of Columbus and Frankin County walked out of Memorial Hall Wednesday night gloriously happy as a result of Lockbourne Air Base’s presentation of Operation Happiness. It was a great present from the airmen to the people of our town.” The reviewer, George Lawrence, went on, “The only discouraging thing was the fact that everybody didn’t get to see this show; for the eighty-five airmen, including WAFs (Women in the Air Force) and enlisted men from Lockbourne put everything they had into Operation Happiness.” He was quoted that the show was to be presented only to airmen in the U.S. and abroad. After performing at a number of bases, the show was performed at a USAF World Wide Personnel Conference in Orlando, Florida. It was such a hit that installations thoughout the United States, Europe and the Far East requested its performance. Very shortly, the U.S. Air Force became the first of the miltary branches to fully integrate the services and the show ended.